I’m ashamed to say I knew very little of Malala Yousafzai before watching Davis Guggenheim’s latest documentary, He Named Me Malala. For those of you in a similar position, Yousafzai is an 18-year-old Pakistani activist. At just 15, she was shot by a member of the Taliban for speaking out for women’s rights to education. She now lives in Birmingham with her mother, father and two brothers, having been transferred there for an intensive period of rehabilitation. And that’s where we meet Malala; in her family home. We learn of her father’s inspirational work championing inclusive education in Pakistan, we hear her entertaining brothers paint an intimate, and overwhelmingly human, portrait of their older sister, however our time spent with Malala’s mother is fleeting, to say the least. We do come to hear the mother’s tragic story, which goes some way to explain her sidelining, but it’s an odd decision nonetheless. I think there would have been a lot to learn from an additional five minutes spent in the mother’s company. Instead Guggenheim mines the more obvious, and more inspirational, seam – that of Malala’s father, Ziauddin – and, fortunately, it’s an angle Guggenheim handles particularly well. Ziauddin is seen to be a fiercely passionate activist and a deeply loving father, and arguably the person who contributed most to Malala’s journey. But, as soon as the documentary seems ready to celebrate the work of a father fighting for his children, the attention is switched back to Malala as she informs us that while it may have been her father who named her, she is the one responsible for the Malala we now know. It’s a powerful message and one delivered with supreme confidence, by both Malala herself and the filmmakers. It’s these intimate present-day moments that shine the brightest. But, there’s a dark story to tell here, one that Guggenheim simply can’t avoid; the shooting. Much of this backstory is told via a series of attractively handcrafted animated sequences, tracing the key moments of her childhood. We even head back to the first public speech her father made as a boy. While the animation can seem overly simplistic on occasion, the portrayal of Ziauddin Yousafzai first finding his voice is a triumphantly beautiful moment. That being said, while some of these flashbacks work very well emotionally, the back and forth structure is ultimately a hindrance. The non-linear chronology lessens the beat-by-beat impact of Malala’s story and the big moment doesn’t hit quite as hard as it could (and should) have. 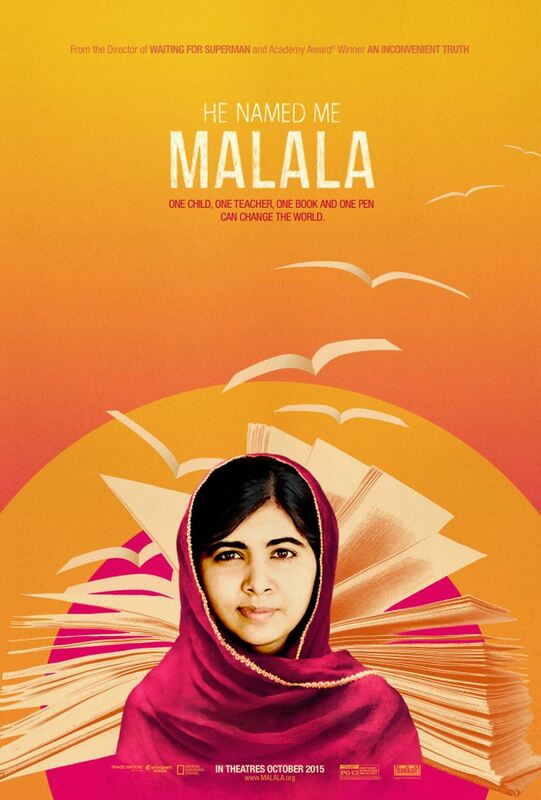 In that regard, one gets the feeling that Guggenheim’s documentary, as a whole, doesn’t quite do Malala’s inspiring story justice. But, what film could have? He Named Me Malala is a truly moving documentary with a terrific subject. Malala Yousafzai is an engaging and eloquent visionary. And she’s not the film’s only fascinating subject. The time spent with Malala’s father expands the scope of the documentary, ensuring it covers the themes of family and love, in addition to the grander ideas present.